Many dogs and cats over the age of five suffer from periodontal disease. This disease is caused by tartar buildup on the teeth. Tartar contains bacteria that can move into the bloodstream and cause serious health problems. Besides bad breath, your pet could also have heart, kidney, and liver damage from poor dental health. During routine physical exams, the veterinarian will evaluate your pet’s mouth and make recommendations regarding their oral health. Signs that your pet’s teeth may need attention include excessive salivation, bad breath, red and inflamed gums, visible tartar, loose or missing teeth, a decrease in appetite, and weight loss. Preventative, routine cleanings are important for your pet’s teeth. The pet is usually dropped off in the morning and picked up late the same day. 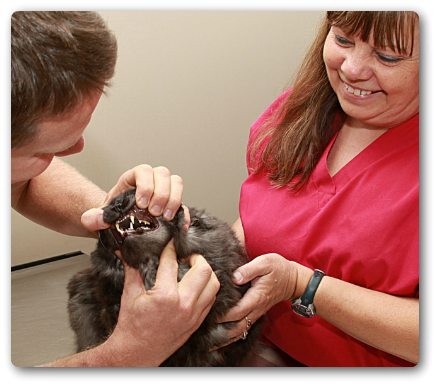 Dental cleanings are done while the animal is under the effects of anesthesia. We recommend pre-anesthetic blood monitoring and IV fluid therapy for each of our dental patients. While anesthetized, a complete oral examination will be performed by the doctor. A technician will clean the teeth by removing the tartar and calculus build-up; chart any defects in the teeth; and polish the teeth with a fluoride paste to help strengthen the enamel and reduce tooth sensitivity. If needed, teeth will be extracted by the doctor. Discharge instructions will be sent home with recommendations for at-home care.